Don’t you require accuracy when shooting in the dark? 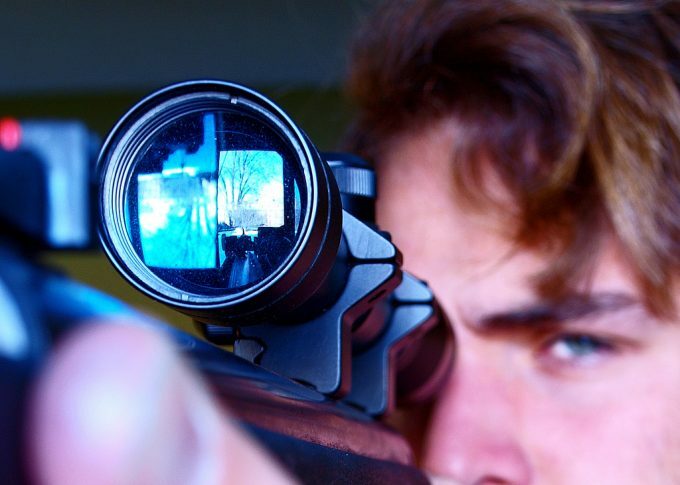 Well, if you are a hunter who has to get rid of hogs after sundown or just love practicing target shooting in low-lit conditions, you must agree that a night vision scope is essential equipment. We first thought of night vision as just reserved for the military, primarily because of the steep prices attached to them. But now with high tech, you can get your hands on an excellent night vision scope for a good price. Our goal is to let you in on the best of these devices which do not mean spending extra on high-quality features that you can get at a much lower price. We have combed the market to find only the night vision scopes that actually matter. These models carry the best optics in different generations. They prove to be reliable and convenient in all your after dark endeavors. And, their best quality must be their affordable price tag. The best night vision scope under $500 not only exists but can be yours. But first, let’s look at the factors you need to consider before getting yourself a night vision scope. Heavy optics may cause fatigue when using the scope for extended periods. It’s always important to note the effect the size of a scope has on your rifle. 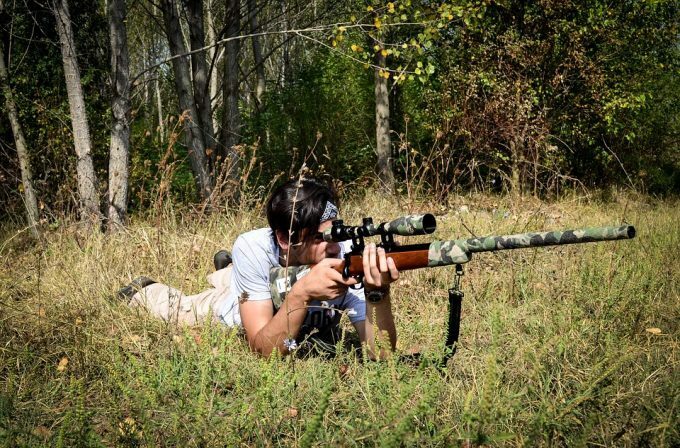 For hunters who do not always take shots in a standing position, this may not always be a concern. For hunters and other users who shoot when standing, you’ll want to eliminate strain when taking consecutive kill shots. Hence the scope should have easy to manage weight. It’s always preferable to carry a small scope when you have to walk for hours. Consider the size of the objective lens as it increases the weight and size. This aspect is usually indicated by lp/mm. To gain a clear view each time, the number on the NVD will provide an indication of the clarity you’ll get with that particular scope. A high number gives bright images with a contrasting background as opposed to a small number. It’s also important that you look into the lens system. Multi-coated optics add to the detailing of the images you see. The high-quality glass is the best as it provides brightly-lit images without distortion. Remember that viewing in the dark poses the challenge of magnifying every small detail in your line of sight. As such, choosing the scope with the best resolution will save you from delays in target acquisition. When using your scope in different environments, you’ll want it to have a robust construction. The tube should withstand heavy usage including recoil and extreme weather conditions. Look for scopes which can handle rifles with heavy recoil, so you don’t keep on readjusting the settings. As much as your scope is well-made, it should also be light enough. Titanium and aluminum provide shock proofing without adding any significant weight. When you want your scope to last a long time, then it should balance between the weight and the materials that make it. You should also consider whether the unit you invest in is protected from bright light exposure. This aspect is important in preserving the life of the optics. Batteries power nearly all civilian night vision scopes. The difference lies in the battery life and the availability of particular model cells. Pick a scope with long battery life if you are going to be out in the field for many hours. You should consider the cost of replacing batteries and if possible whether you can get rechargeable ones. Alkaline batteries are readily available while lithium is only in specific stores. You will no doubt also consider the range that your scope can cover. There are some differences to take into account even if you are familiar with normal day use scopes. First off you will need to accept that the scope will not have the same range as a day time scope. Also, you will need to understand that the range may be dependent on the ambient light of the situation. In some cases, like a full moon, you may find yourself with a lot of light and reach the maximum advertised range. However, on a cloudy moonless night your range may be greatly reduced. Now that you are familiar with some of the top features in these scopes, it is time to take a closer look at some of the top offerings. Any of these could be a great choice, so keep in mind your particular needs as you go through them. 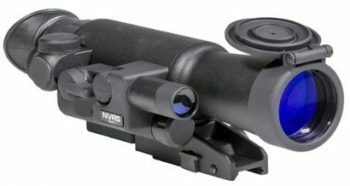 Description: Yukon NVRS Titanium 1.5×42 Scope represents a high-end device which comes at a very affordable price. It is one of the smallest in its class, such that it fits low on the gun giving it the advantage of taking recoil with grace. It comes with a 42 mm objective lens to provide high-resolution images. Its lens is powerful enough to gather as much light in the darkest of conditions; hence you get a clear view replete with all the details you’d want to see in the background. This night vision rifle scope is equipped with an infrared pulse illuminator which comes in handy to light up the images you see even further. What’s more, it bears multicoated lens and an illuminated reticle which lets you have high contrast over all the pictures in your line of your sight. This way, targeting and making the kill shot is fast and easy. This scope comes with the advantage of being able to accept a digital camera. It can also take a whole range of other accessories including dual lens, IR Illuminator, laser pointer and even an AK adapter. Other additional features include a flip-up lens cover which acts as a protective layer against the elements. You’ll also like that the components are in a titanium body which makes it a durable piece. And, because of this construction, it can accommodate a range of rifles even those that have a bolt action style. Related: There’s also an excellent night vision monocular by Yukon. 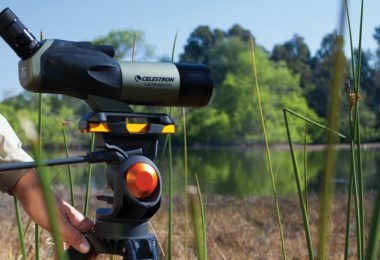 The Yukon NVMT Monocular is for those who desire a subtle unit to take anywhere with ease. It has a full field of view at 30-degrees and comes with a big objective for maximum light gathering. Description: Armasight Advanced Integrated AIM Pro Scope comes from a popular brand. The features are exceptional to serve you in its best condition. This scope mount carries the capacity to convert any standard day vision monocular into a night vision monocular so that you won’t be spending extra on night vision equipment like co-witnessed red dot sight or infrared lasers. It comes complete with a mounting platform where if you mount it together with day or night vision monocular, you can switch between day and night modes effectively. This mount allows you to acquire a full field of view thanks to the fact that it allows focusing digitally. The brightness on the reticle can be easily readjusted for quick targeting. With it, you can make up to eleven different types of illumination changes; hence it allows you to have a custom view. You’ll also love that it is submersible up to 1meters for around half an hour. When it comes to the aiming solutions, this mount makes it easy on day focusing by giving the option of 3.5x magnification. This system is perfect for hunting at close range as it allows for quick sighting in changes in the case of random and dangerous situations. You’ll also love that it has a subtle HUD-type prism which allows the scope a 65 MOA circle to project. It also acquires a 3.2 MOA reticle which helps in fast target acquisition even in the darkest of nights. Related: You may also want to invest in the Armasight Advanced Integrated Mount Aim Pro-L Monocular. It is a perfect match for a night vision monocular with 3x magnification. It also uses digital reticle brightness adjustments. The mount is compatible with any standard Weaver or Picatinny mount. It locks the zero to eliminate sighting in after every installation. 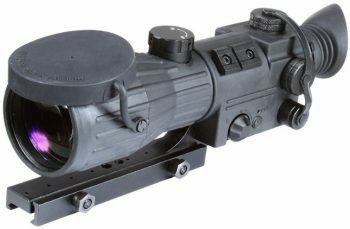 Description: Firefield FF16001 3×42 mm Scope is a new entry in the night vision industry. This does not mean the features are mediocre in any sense. In fact, this is one of the most decent scopes on the market today. This is a generation 1 scope which provides high levels of accuracy in mid-range to long range shooting. The powerful IR illuminator is crucial in extending your possibilities since it increases the qualities of the imagery. This scope has a low 3X power which allows you to recognize objects in the dark. You’ll also be able to separate the point of aim from the other targets since the duplex reticle can change brightness settings from one to another. You’ll be able to hunt in a wide range of environments, owing to the rugged frame construction. The titanium body keeps it secure when venturing in rough terrain as it can take a few bumps and remain in top working condition. The Firefield utilizes a quick detach mounting system. The Weaver mount makes it possible to change the iron sights, and still, it maintains its point of aim. You don’t have to refocus the elevation and windage as it locks the zero into position even after reinstalling it on a different gun. Not to mention; it comes with a lens cover to protect the lenses against bright light. Related: Get to expand your observation capabilities with the Firefield 5×50 Nightfall 2 Monocular. It is ergonomically designed for a tight grip since it is textured. 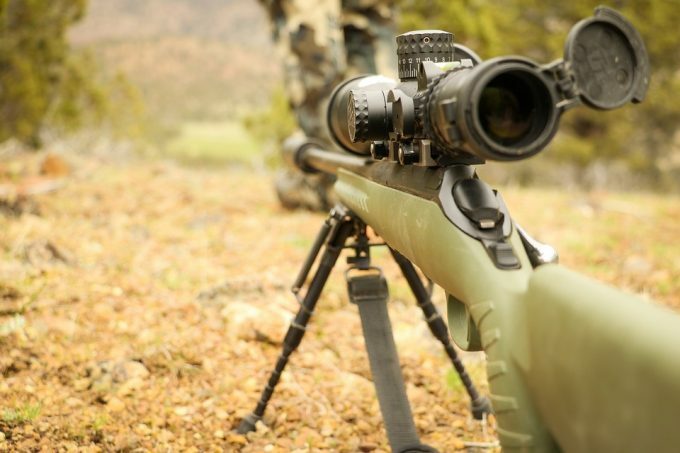 The magnification is high to provide for better clarity in long range shooting. Description: Armasight ORION 5X Scope comes with many technical advantages. It has an ergonomic styling in a rugged tube which is contained in a rubberized aluminum body. It is the perfect match for extreme weather conditions since it is water and shock resistant. The rubber finish gives a sure grip so that you can focus without losing your point of aim. You’ll agree that the 5X power along with the infrared illuminator provides the best viewing experience. 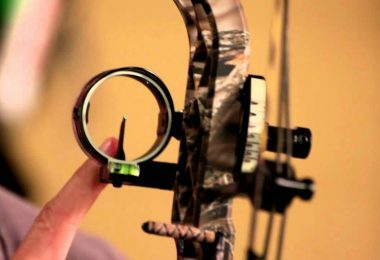 It allows for ½ MOA windage and elevation adjustments making it easy for you to focus and take accurate shots. This scope also has a large exit pupil at 8 mm to give a comfortable view. It eliminates peeking into the focus lens when it is dark. The objective lens makes this happen since it is not too big to interfere with the focus lens. You get up to work with 40 hours of battery life with the 3V CR123A battery. This convenience extends further with the battery indicator plus its battery type is readily available. Another excellent aspect is that it mounts in standard Weaver which allows it to sit low on the rifle. This means that it can retain the zero even when you use a gun with high recoil. Related: When it comes to mounting your device, you should consider the Armasight Picatinny Mount Adapter Quick Release. 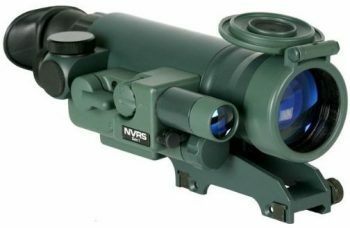 It allows for the night vision scope to sit low on the rifle while providing significant resistance against high recoil shots. Description: Sightmark Digital Photon XT 4.6x42S Scope lets you improve your night shooting abilities. The manufacturer knows exactly the after dark conditions; that’s why they provide technology advancements to ensure maximum comfort. First, you can use it for both day and night vision. With six reticle styles, you’ll be able to customize your shooting style from using a crossbow to varmint hunting and even being able to use it on rangefinders. This scope is digitally designed to adapt a video output record. 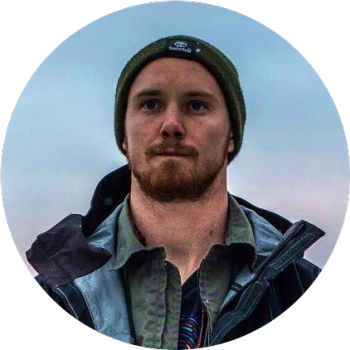 You can view your expeditions after being out in the field; thus giving you the chance to relive your best moments. It is 30% lighter than other scopes so as not to add any weight to your rifle. You’ll like that it has a LED display which provides for a detailed view. The resolution is over the top which makes it possible to identify objects for fast focusing. The Sightmark is a must have if you wear glasses. This is because it comes with a long eye relief which makes it easy for you to watch the subject in a comfortable view, closer to the eyes. You’ll love that with the 810nm infrared wavelength; you are set for a quiet night since it is invisible. This way, you can get to the closest safe distance without being detected. Related: You’ll also benefit greatly with the Sightmark Photon 6.5x50S Scope. It is also a digital night vision riflescope. It has six digital reticle styles to improve your accuracy in different shooting environments. It has high resolution plus it comes with 810nm LED infrared illuminator. 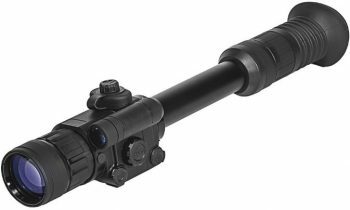 Description: Armasight ORION 4X Scope is not only powerful, but it is also compact with high-performance features. The magnification power is crucial in providing a wide angle of view hence giving you every detail of the subject. You’ll be able to focus on simplicity thanks to the fast focus diopter. It is in a textured design to provide a tight grip in wet conditions and when you wear gloves. This scope comes with an illuminated reticle which makes it easy for you to figure out dark targets like hogs. You’ll not need an extra source of lighting, but for long range hunting, the detachable infrared light is an essential accessory. With the long battery life of around forty hours, you can be out longer than when using a scope with regular batteries. You are also in luck since it has an indicator and as such, the scope will never die on you without prior warning. The ORION 4X is completely weatherproofed, starting with the shock protected optics. Now you can be on random grounds, and it still manages to deliver high-resolution images. The aluminum tube is rubberized to act as a shock absorber when it bumps onto rough surfaces. You’ll also be pleased by the multi coated lenses which prevent reflection of light to allow for bright pictures each time. Related: Armasight produces a line of high-end products. When you want to boost your observations, the Armasight CO-MR-SD Gen 2+ Clip On System will come in handy. You’ll get brighter images, and you can control it remotely. It converts any day light scope from day to night vision as it carries automatic brightness settings. Description: Yukon Varmint Hunter Titanium 2.5X50 Scope comes from a company that continues to prove it can produce durable and convenient products. 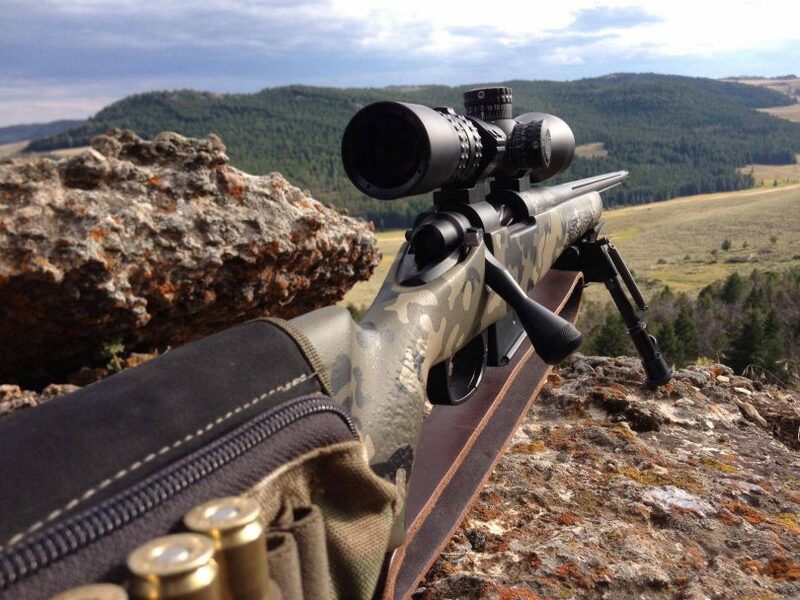 The Yukon 2.5×50 has convenient features that will make your night time shooting go smoothly. The low power is just the correct remedy to ensure that you get a wider than usual field of view. The infrared illuminator is the solution for superior imagery when you want to make quick kill shots. The imaging does not stop at the illuminator since it also uses multi coated optics. 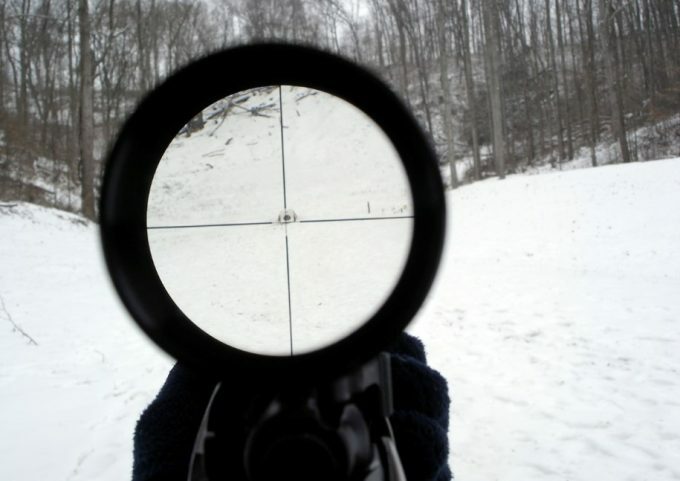 This way, you can be in dangerous situations, but the scope will provide a discrete view. It makes it hard for light to be reflected away enabling the user to hide their position. The red on green mil dot reticle is a crucial entity as it has an internal allowance to adjust for windage and elevation. The brightness intensity is also changeable with an outer knob. This scope comes in a Gen 1 titanium tube. The tube protects the compartments from being subjected to any exterior bright light which may damage the optics. The oblique shaped eyecup comes to offer a snug fit closer to the eye. It eliminates the strain that comes with viewing objects when you have insufficient eye relief. Also, it achieves a high resolution such that you can see the target more clearly out to further distances. Related: When you want to range further, it just right you invest in the monocular for the job. The Yukon Nvmt 4×50 Monocular is a night vision monocular which gives the user a wide angle of view. It also allows for fast target acquisition in long distance shooting. Description: Armasight WWZ 4X Scope is made for the experts in demanding shooting situations. It is a small and lightweight unit which mounts fast and secure on many different types of guns. It allows for quick target acquisition thanks to the precision lens focusing system. Sighting in is always comfortable with the illuminated red cross reticle; thus accuracy improves immensely. This scope allows quick windage and elevation adjustments at ¾ MOA. You can never go wrong with such accuracy at hand along with variable reticle brightness. This way, you can be in random environments and still be safe as you set the intensity to just the right position. It also comes with a detachable long-range infrared illuminator. It provides for extended usage when shooting far distances. 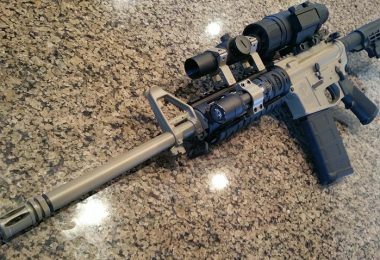 When it comes to protecting the optics, you’ll like that it comes in an aluminum housing. This way, all the internal elements can face of the outdoor conditions. The tube seals completely against water, fog, and dust. You’ll always take consistent shots since with the shock-corrected optics and recoil is better managed. Related: Expand your capabilities with the Armasight Dark Strider Night Vision Binocular. It also has Gen 1 optics which is easy to operate. It will come in handy when tracking fast moving targets in dark environments. Increase your accuracy when shooting in low-lit situations with the above night vision scopes. The optics along with the illuminated reticle gives you the most comfortable shooting experience. By looking at the features that make each unit, you can tell which model stands out when meeting your needs. Hopefully, with this information, you can pick out a night vision scope without making many compromises. Finally, we’d like to hear from you. If you have any experiences with our picks, please let us know in the comments section below.